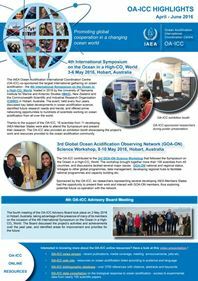 Ocean acidification, resulting from changes in ocean chemistry induced by increasing seawater carbon dioxide concentrations, is one of the growing challenges to marine organisms, ecosystems and biogeochemical cycling. Some of the fastest rates of ocean acidification currently observed are in the Arctic Ocean, with important physiological and geochemical thresholds already surpassed. Projections indicate that large parts of the Arctic Ocean are undergoing marine carbonate system changes that will incur significant shifts in ecological status over the coming decades unless global carbon emissions are drastically curtailed. These changes in water chemistry and biology will have significant socio-ecological and economic consequences at the local to global level. 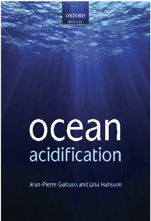 The first AMAP Arctic Ocean acidification report (AMAP, 2013) presented a scientific assessment on the changing state of ocean acidification in the Arctic and provided an Arctic-wide perspective on the rapid increase in seawater acidity. The report concluded that ocean acidification was affecting the Arctic marine environment and ecosystems. In a warming environment, permafrost thawing can play a significant role in the chemical composition of coastal waters in the Arctic region. It is a potential source of organic and inorganic forms of nutrients, as well as heavy metals and pollutants. To estimate the permafrost thawing influence on the chemical properties of the sea water, an experimental study was conducted as part of a Norwegian-Russian expedition to Svalbard 11–17 June 2017. Permafrost (PF) samples were collected at an abrasive cliff 10 km west of Longyearbyen, after that, the experiment was performed at the University of Svalbard laboratory. The experiment was focused on identifying the possible changes in concentrations of nutrients, carbonate system parameters, and pollutant composition related to permafrost thawing. During the experiment, the samples of permafrost were added to the seawater. Then, the solution was exposed to natural conditions outdoors for 24 hours while water samples from the solution were taken at specified time intervals. Data from the experiment allowed for estimating the rate and change in concentrations of chemical substances due to permafrost thawing. This study shows the importance of permafrost thawing in the coastal areas chemical regime, affecting the metals supply, ocean acidification, and nutrient inputs; therefore, coastal ecosystems could be exposed to new impacts of numerous stresses associated with global warming. In the Arctic Ocean, climate change effects such as warming and ocean acidification (OA) are manifesting faster than in other regions. Yet, we are lacking a mechanistic understanding of the interactive effects of these drivers on Arctic primary producers. In the current study, one of the most abundant species of the Arctic Ocean, the prasinophyte Micromonas pusilla, was exposed to a range of different pCO2 levels at two temperatures representing realistic current and future scenarios for nutrient-replete conditions. We observed that warming and OA synergistically increased growth rates at intermediate to high pCO2 levels. Furthermore, elevated temperatures shifted the pCO2 optimum of biomass production to higher levels. Based on changes in cellular composition and photophysiology, we hypothesise that the observed synergies can be explained by beneficial effects of warming on carbon fixation in combination with facilitated carbon acquisition under OA. Our findings help to understand the higher abundances of picoeukaryotes such as M. pusilla under OA, as has been observed in many mesocosm studies. Svalbard’s climate is strongly influenced by the adjacent seas. Late-summer measurements collected over the last 52 years show that the temperature of warm Atlantic water flowing into the Arctic Ocean via in the West Spitsbergen Current has increased by 1.4 – 1.7 °C during the measurement period, equivalent to a rate of 0.27 – 0.33 °C per decade. The rate of warming has remained rather constant over the 52-year measurement period, excepting two warm (2005-2006, 2016-2017) anomalies and onecool (1998) anomaly. The West Spitsbergen current is an extension of the North Atlantic drift system and the trends observed in Eastern Fram Strait are largely due to increases in the temperature of water transported northwards from the sub-polar and sub-tropical Atlantic. Similar warming trends have been observed at other observatories along the North Atlantic Current system. The causes of this warming trend are the subject of ongoing research, and relevant factors include: variations in subtropical Atlantic water temperature; the rate of advection along the North Atlantic Current and the extent of wind induced surface cooling on route. The marine environment of many Svalbard fjords is strongly influenced by warm Atlantic water supplied by the West Spitsbergen Current or Barents Sea (at depth) and by glacial meltwater supplied from Svalbard glaciers (at the surface). Increased freshwater addition decreases aragonite and calcite saturation (Ω) and pH level, and increases the ocean acidification state to levels that are critical for calcium-carbonate forming marine organisms. Particularly sensitive to this change is the aragonite-shell forming pteropod Limacina helicina, living in fjords and areas that are already near critical limits (Ω< 1.4) for calcification.